A paver driveway offers structural longevity as well as an amazing opportunity for character and expression. Because pavers are a flexible system, you will never have to deal with cracked concrete or crumbling asphalt. 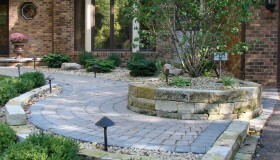 Pavers also offer flexibility in expansion or repair. Aside from the structural benefits of pavers, there is no driveway as beautiful as a hand laid piece of art. Colors, textures, and patterns can help turn a driveway into a compliment to the home, rather than just a necessity. We are an ICPI Certified Paver Installer.